Bringing a fresh new twist to Pud Inn Club: Pud Inn goes on Tour….around Sheffield! Join us on a walking tour on Saturday 24th January to four fantastic Sheffield cafes to enjoy four special cakes/puds, supporting our city’s independent eateries and sprinkled with 15 equally fun and lovely Sheffield folks. A full afternoon of walking and eating desserts…..bliss! With a special ‘Favourites‘ pudding theme, cafes will be sharing some of their favourite, best selling baked treats with diners. £8 per person/tickets (for four fantastic puds). Please e-mail your booking request to puddingclub@missiecindz.com or DM via twitter or Facebook, where we will confirm availability and payment details. Please note, PLACES ARE VERY LIMITED and booking is essential so that we can reserve your spoon. What’s on the menu? 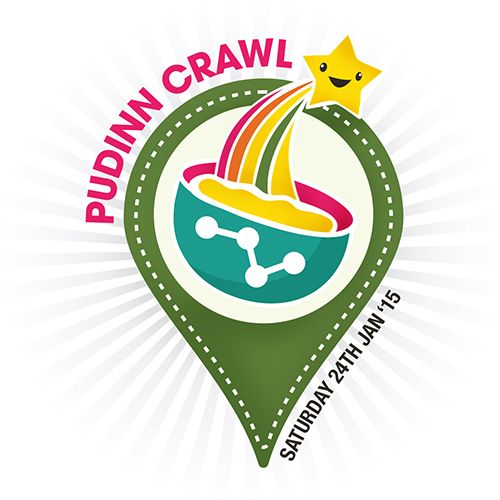 – it’s a secret until the day of Pud Inn Crawl! You can also vote, for fun, your favourite pudding of the Tour. It’s going to be Forking Marvellous!! If you’re unable to join us on the full Tour, you can join in somewhere along the route and that’s fine too – but we do encourage that you join us at all four venues as this helps us to prioritise pudding portions and allocate spaces available for the event. Otherwise you will be responsible for your own cake/pudding purchases. For more information and to keep updated with the event’s happenings, visit our events Facebook page. Pud Inn’s GREAT! Support your local pub, local bakers, local talent AND brighten the community! What’s not to love!? It is a friendly and informal afternoon with other pudding enthusiasts from Sheffield and beyond – if you want to come alone and make new friends, then that’s fine too.